Let’s be clear right up front. Because Uganda’s parks suffered such a massive poaching scourge during the turbulent 1980s it is a second tier safari destination in comparison to its neighbors Kenya and Tanzania. Though that does not mean you shouldn’t consider it. Wildlife populations have rebounded in the national parks and the Ziwa Rhino Sanctuary means you can score the Big Five in Uganda again. But, ironically, the safari animals are not the main reason to do a safari here; it’s a variety of other things that make Uganda a special destination. Scenically Uganda holds its own with any other country – the mountains and lakes of the southwest are postcard perfect, standing atop Murchison Falls is exhilarating and Kidepo Valley is simply amazing. The safari experience is also great because the national parks receive far fewer visitors than most parks in other countries. The day I went searching for the tree-climbing lions at Queen Elizabeth National Park I didn’t see another vehicle the entire morning. Plus, the mix of Central African rainforest and East African savannah, hosting over 1000 species of bird, makes Uganda one of the best bird-watching destinations not just in Africa, but the world. But more than anything it’s the chance to see gorillas that makes Uganda excellent for safaris. Over half of the world’s remaining mountain gorillas live in Bwindi and Mgahinga Gorilla national parks where groups have been habituated to humans to allow up-close encounters. It’s one of the most amazing wildlife experiences a person can have. This unique combination of factors, not available anywhere else, is why overall, Uganda is solidly one of my favorite countries in Africa and I’ve met others who share this opinion. Whether it’s your first safari or your tenth, Uganda can make it special. Dubbed ‘the pearl of Africa’ by Sir Winston Churchill, Uganda is one of the continent’s most beautiful and welcoming countries. This tiny landlocked East African nation possesses a staggering wealth of natural assets: foremost amongst these are the world-renowned primate safaris through the verdant rainforests of southwest Uganda, which lure intrepid visitors with the promise of unforgettable encounters with habituated families of critically endangered mountain gorillas and opportunities to trek in search of our closest living relatives, chimpanzees. With Kibale Forest boasting the highest primate density in the world and Bwindi home to half of the world's remaining mountain gorillas, Uganda is a modern-day mecca for primate-lovers. While primates definitely top the safari agenda here, Uganda is home to much, much more… Spilling out of gigantic Lake Victoria, the White Nile offers world-class whitewater rafting at Jinja and further downstream the impressive Murchison Falls thunders through one of the country’s most scenically spectacular national parks. Uganda also lays claim to Africa’s highest mountain range, the Rwenzoris, along with some of the region's more uncrowded and attractive wildlife areas. I wholeheartedly agree that trekking to see the mountain gorillas is something that every safari goer should strive to experience at least once in their lifetime, but, in my opinion, Uganda’s greatest safari attraction remains hidden and undiscovered in a far-flung corner of this diverse country. Unknown to all but the most committed and adventurous safari-goers, the wild Kidepo Valley beckons to wildlife enthusiasts looking for an off-the-beaten-track safari experience in a world-class park that they can call their own. From Queen Elizabeth National Park, the country’s premier safari destination, in the east to the remote wilderness savannas of Kidepo National Park in the northwest, there is little doubt that Uganda truly has it all. What I really like is that all these action attractions are bottled into a small, friendly equatorial country with a decent road infrastructure that enables safari-goers to drive between their chosen parks and safari lodges, thereby getting a much better understanding and appreciation of the country as a whole, while simultaneously keeping the cost of their chosen safari down by foregoing the need to take the usual expensive charter flights. I spent a month travelling around Uganda with a self-drive, expedition-prepared Landcruiser and visited almost every national park in the country. Uganda was a revelation! I had not expected such a richness of wildlife or such great concentration. Uganda has everything that her more famous neighbour Kenya has...plus such once-in-a-lifetime sightings as gorillas and chimpanzees. Queen Elizabeth National Park and Murchison Falls are justifiably the country’s biggest drawcards but if you have time head for Kidepo Valley National Park (in the far north, bordering Sudan). I hesitate to make such a rash statement (with so much of Africa offering so much incredible safari potential...and with so much of it that I am still to see) but if I was pushed into a vote I would say that Kidepo is probably the most stunning national park in all Africa! 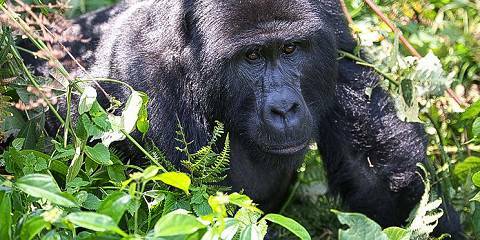 Uganda’s biggest attraction is mountain gorilla tracking. Seeing these gentle giants has been one of my best wildlife experiences ever. With Congo being unstable, Rwanda is the only other country where this is offered. Aside from gorillas, the forests of Uganda are a good place for seeing a wide variety of primates including the charismatic chimpanzees. Many tourists pop over to Uganda for a quick gorilla visit after their Kenya or Tanzania safari, but Uganda is a worthwhile savanna safari destination in its own right. Both Queen Elizabeth and Murchison Falls national parks offer good sightings of lions, elephants, buffalo and other savannah wildlife. The quite recently established Ziwa Rhino Sanctuary is a great place to see white rhino on foot. The game viewing might not quite be on a par with Kenya and Tanzania, but the stunning scenery makes up for that. One of my highlights is the boat trip on the Nile to the base of Murchison Falls, where the water forces its way through the narrow gap in the Rift Valley escarpment. Tourist numbers are much lower and the industry doesn’t seem as mature as in its neighbouring countries, but if you can handle a few hiccups, that might be part of the appeal. With more than 1,000 bird species, Uganda is a fantastic birding destination – even non-birders will enjoy seeing specials like the prehistoric-looking Shoebill. Uganda’s central attraction is the opportunity to track one of the world’s last surviving mountain gorilla populations on the misty green slopes of Bwindi Impenetrable or Mgahinga National Park. This is arguably the ultimate African wildlife encounter: the simple exhilaration attached to first setting eyes on one of these gentle giants is difficult to describe. These are enormous animals – a male silverback weighs three times as much as the average man, its bulk is exaggerated by a shaggily luxuriant coat – but also astonishingly peaceable, with the initially disconcerting but ultimately winning habit of staring deep into the eyes of human visitors, with soft brown eyes that appear to be seeking out some sort of connection. True, that magical hour with Uganda’s gorillas is relatively expensive and the trek up can sometimes be hard work, but in almost 30 years writing about Uganda, I have yet to meet anybody who has gone gorilla-tracking and regretted the financial or physical expense. Global perceptions of Uganda are dominated by the excesses of the late dictator Idi Amin, who actually last set foot in the country way back in 1979. And contrary to popular perception, Uganda has emerged in recent years as one of Africa’s finest eco-tourist destinations, thanks to its exceptional biodiversity, combining elements of the East African Savannah and Central African rainforest Gorillas aside, several locations in Uganda offer excellent chimpanzee tracking, and a diversity of smaller primates abounds in Kibale Forest and Semliki Valley. The country is also perhaps the finest birding destination in Africa, with more than 1000 species recorded in an area the size of Great Britain. Certainly, there is no better place to see the rare swamp-dwelling shoebill, along with dozens of rainforest specialists associated with the Congo Basin. Fully recovered from the turmoil of the Amin years, Uganda’s main savanna reserves – Queen Elizabeth, Murchison Falls and Kidepo Valley national parks – now support healthy populations of elephant, lion, buffalo, hippo and various antelope. Ishasha, in the far south of Queen Elizabeth and Murchison Falls national parks, is the most reliable place in Africa for tree-climbing lions - a magical sight that frequently reduces the most experienced safari-goers to slack-jawed awe. Other attractions include chimpanzee tracking in Kibale National Park and looking for rhinos on foot in the recently created Ziwa Rhino Sanctuary. Uganda’s top-billing wildlife attraction is of course a visit to the Bwindi Forest National Park to trek into the jungly hills in seach of an encounter with one of three habituated groups of endangered mountain gorillas. This is an experience I’ve never heard a negative review of and it’s definitely on my lifetime must-do list. But if time (there’s often a year-long waiting list for independent visitors) money ($500 for foreign nationals) or fitness prevent you hooking up with these hairy celebrities, you can substitute chimpanzees for gorillas in Kibale National Park. Be warned though that the chimps here are not as habituated to humans as the gorillas – on my visit, the only hint of their presence was an abandoned nest high in the treetops. Murchison Falls National Park is a great option if you are already in the country, being only a days’ long drive from Kampala, and boasting spectacular waterfalls and fun river safaris to spot Spoonbill storks and hippos. But in general, primates and birds are the stars of the Ugandan wildlife scene, and I’d suggest that those wanting a classic ‘big five’ safari experience in East Africa are probably better heading to Tanzania or Kenya. Most of the superlative descriptions you read about Uganda are totally true, and it really is a place of shimmering lakes, lofty mountains and mysterious forests. 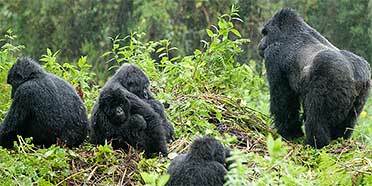 Best known as the place to see mountain gorillas, no safari to the country should exclude this magnificent experience. I’ve been privileged to visit them several times; each uniquely special and well-worth the trek it takes to find them on Bwindi’s almost sheer vertical slopes. Also in the southwest, I love the refreshing sight of the brilliantly-green terraced hillsides, and seeing farmers wobble along on ancient black bicycles with piles of green bananas, mangoes, and pineapples strapped precariously across them is one of Uganda’s most enduring images. Other safari highlights include the Queen Elizabeth National Park; unlike the rest of Uganda it’s more reminiscent of typical grassland habitats seen in Kenya and Tanzania and is good for spotting hippos and crocs in the great lakes, and Murchison Falls, famous for its waterfall on the Nile and the spectacular birdlife (a sighting of a shoebill stork here would be a massive tick on any birdwatcher’s list). I’ve seen other primates too at Kibale, where I’ve chased chimpanzees at high speed through the forest, and on Ngamba Island, where I’ve had the rare opportunity to see chimps wade into Lake Victoria. At Jinja, there’s the opportunity to go white-water rafting among many other adventure activities at the source of the Nile, and Kampala with its mind-boggling matatu stands and colourful markets offers a fascinating insight into typical African street life. Overall, as a safari destination, what Uganda may lack in herds of large game species roaming across giant landscapes, it more than makes up with its beautifully verdant and fertile scenery. It also has the privilege of having that particularly special star quality of the gorillas. It’s been said by better people than me (Sir Winston Churchill for one, who famously described Uganda as “The pearl of Africa”), that Uganda is one of the most beautiful countries in Africa. In fact, as far as I am concerned, it’s one of the most beautiful countries in the world and I don’t just mean it’s physically beautiful. The people themselves, who seem permanently to smile, are as beautiful and welcoming as the landscape. Funny then that Uganda has yet to make it into many a tour company brochure and, as one Australian tour operator told me recently, “Many people think Uganda is a dangerous place”. I couldn’t disagree more. Every time I’m lucky enough to visit this lush and green country I have an immense feeling of happiness come over me. Uganda might not have the great herds of wildlife of neighbouring Kenya and Tanzania but this is a country that rewards in so many other ways. It’s fairly small which means that within only four or five hours of landing at Entebbe airport you can be in a rainforest tracking habituated chimps, watching a lion prowl a golden savannah-scape or put-puttering over the waters of Lake Victoria to the idyllic Sesse Islands. It’s geographically and climatically diverse: you can shiver through the snow fields of the Ruwenzoris, more romantically known as the Mountains of the Moon, one day and drive across an arid semi-desert landscape in the northeast the next. It’s friendly, safe and ethnically diverse. And, for East Africa, it’s cheap. Entry to the national parks is generally much lower than that of neighbouring countries and for around €70-100 you can score yourself a bed in a beautiful hotel, guesthouse or lodge. So, if you’re looking for a safari destination that offers pretty much a bit of everything but that still retains a sense of the unusual then Uganda is unlikely to disappoint. Most people understandably come to Uganda for its mountain gorillas – half of the world’s population of around 730 lives in Bwindi Impenetrable National Park, and spending that precious hour with them has become a “must-do” for anyone who loves Africa and its wildlife. But there’s a lot more to Uganda than this and gradually people are beginning to explore further afield. Until a few years ago, Murchison Falls NP, where the wild Nile squeezes through a tiny fissure in the Rift Valley Escarpment forming one of the most dramatic waterfalls on the continent, was a no-go area because of the activities of the Lord’s Resistance Army. Today, it’s firmly back on the travellers’ radar. Similarly, Rwenzori Mountains National Park reopened 10 years ago and is now on the schedule of many adventure travel operators offering climbs of Mount Stanley. But be warned – I’ve trekked to the summits of the five highest peaks in Africa including Kilimanjaro, and Mount Stanley was by far the toughest. A few years later, looking at the distant mountain range from the serene beauty of Queen Elizabeth NP, I could hardly believe I’d been on top of those peaks peeping through the clouds. Queen Elizabeth NP is deservedly known as Uganda’s premier wildlife reserve and as home to some 600+ bird species, is regarded by birding enthusiasts as one of the best on the continent. If you’re interested in seeing village life in Uganda, I’d recommend visiting Kazinga-Bukorwe village on the outskirts of QENP, where they run a community tourism initiative. It’s a genuine insight into how locals live alongside the wildlife we love to see, and provides a more rounded picture of life in the bush. Adrenaline junkies will want to try white water rafting along the Nile at Jinja, one of the scariest experiences of my life and one I personally have no desire to repeat. For an altogether more peaceful experience, head to the Ssese Islands on Lake Victoria and enjoy a few days just chilling on its shores. Or visit Ngamba Island and spend a day or more helping out in its wonderful chimpanzee sanctuary – it’s impossible not to be charmed by these playful primates, our closest cousins. The word is getting out about Uganda. If you haven’t got it on your list of East African safari destinations I suggest you add it…quickly. Uganda does not have the reputation for the variety or density of wildlife, especially the large mammals, as its more famous neighbours (Kenya and Tanzania). However, watching wildlife is a unique experience in a this welcoming and stunningly beautiful country. 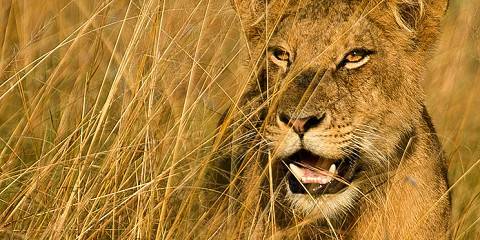 mountains – habitats which provide all manner of exciting wildlife moments on safari. 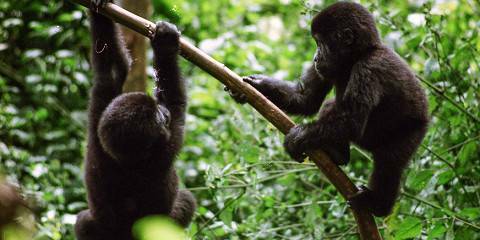 At the top of the list are those critically endangered, gentle furballs – mountain gorillas. Uganda is one of the few countries in Africa where you can see mountain gorillas in the wild, lolling about deep in jungle forests. It’s surely one of the most special and unique wildlife watching opportunities on the continent. small gestures, movements and expressions will leave you astonished. numerous parks, lions are around (I’ve had good sightings in several Ugandan parks) and if you’re lucky, leopards. There are however few opportunities to see rhino. So, in summary, the ‘don’t miss wildlife experiences in Uganda’ are: tracking mountain gorillas; a visit to Kidepo Valley; and running after chimps swinging through the treetops. Uganda is a gem – if you’re heading to East Africa, don’t miss it. Uganda has a modest profile among Africa’s top safari destinations. With no parks of the size or popularity of Kruger, Chobe, Serengeti or other such A-listers, its main wildlife drawcard has become the mountain gorilla. Alongside Rwanda, the country undoubtedly offers Africa’s best opportunity for close encounters with this impressive and endangered primate. Indeed, many visitors arrive just for this experience, taking the rest of their safari elsewhere. There is no denying that a gorilla trek in the steep, damp forests of Bwindi National Park is one of the world’s great wildlife experiences – as is the equally thrilling chimp trekking at Kibale. However, this focus on the two great apes does not do justice to the breadth of Uganda’s appeal. Yes, the country may not offer quite the same sense of scale and spectacle as some of its larger neighbours. Small and heavily populated, it has fewer tracts of undisturbed wilderness. Yet, for its size, it is arguably the most biodiverse destination in Africa – a fact largely explained by its straddling of two very different biomes: the equatorial rainforests of the Congo Basin and the tropical savannas of East Africa. A safari here thus offers both plains game and forest dwellers. Add to this the semi-arid country of the north, and you can end up with an amazing haul of species. Primates are certainly a top drawcard. The two great apes were among an impressive 13 species that I saw on my most recent trip – as high a total as you might expect anywhere in the monkey-rich Amazon. Move away from the forests to the savannah reserves of Murchison Falls and Queen Elizabeth national parks, however, and you’ll also find healthy populations of elephant and buffalo, plus plentiful antelope – including hartebeest, topi and the local special, Uganda kob. Large predators, including lion, leopard and spotted hyena, occur in small numbers but are regularly seen in key locations, while Kidepo’s open grasslands in the north are also home to cheetah. On protected waterways, hippos and crocodiles are very abundant, while Mburo National Park has zebra, Murchison Falls has Rothschild’s giraffe, and little-known species such as giant forest hog and potto can also be seen, if you know where to look. For African birders, Uganda needs little introduction and tops many a bucket list. The profusion of species, from shy rainforest rarities, including many Albertine Rift endemics, to the raptors and songbirds of the savannahs and the pageant of wetland water birds, is unrivalled. Even Entebbe Botanical Gardens can produce an excellent day’s birding, including species such as Ross’s turaco and African grey parrot that are hard to find elsewhere in East Africa. Pride of place undoubtedly goes to the huge and bizarre shoebill – relatively easily seen both at Murchison Falls and on Mabamba swamps beside Lake Victoria. Uganda is small, no larger than the UK, which means that you can take in most of its key destinations on a single safari. The national parks are well set-up for visitors, the welcome famously friendly and the standard of guiding generally excellent. Journeys on the country’s rough roads can be arduous, admittedly, and can take longer than any map might suggest. But the rewards make it well worth your while.